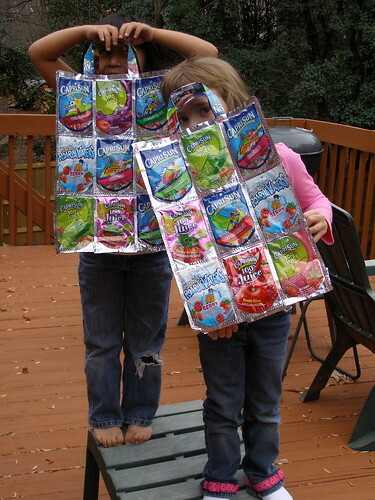 Over the Thanksgiving weekend, I found a little time to finally complete a project I’ve been wanting to work on: big (grocery-bag sized) totes made from saved CapriSun pouches! The girls are pretty excited about their bags, although they don’t yet have big plans for what they intend to carry around in them. After completing the first one, I realized that these would make great reusable grocery bags–perhaps even to hold frozen items (since they are plenty durable and made of foil)! I sort of made this up, although I admit I used the instructions in the video below to make a couple of smaller bags a couple of months ago, so you could say I was inspired by SarahLynnTea (who is quite the little crafter–check out some of her other videos). Now, can someone tell me how to stop saving these? Now that I’ve made something useful from a huge stack of them, I can’t throw another pouch away.